In our first two posts we reviewed two of the most popular platforms for social business portals, Jive and Sharepoint. We found that Jive is feature-rich, user friendly, but also expensive. Sharepoint on the other hand is less user friendly, but a powerful tool nonetheless, particularly for businesses that use Microsoft products extensively. In this review we will examine Drupal Commons 3.0, an open-source Drupal-based platform. For the Drupal Commons review, I went to the official website and downloaded a copy to try it out on my local box. Acquia, the parent company behind Drupal, offers services around this product. Commons, like Drupal, is an open-source product that is installed just like a normal Drupal site. I have played with previous versions before but this version has been completely rebuilt in Drupal 7 and appears to be much improved. Commons is distributed under the GNU general public license meaning that this product is fully open-source. The costs come from the labor required to install and customize the Commons site (Acquia has an article advocating their product pricing competitiveness here). One of the great things about Drupal is that you have thousands of developers and hundreds of companies available to support the product. That means organizations of any size can find labor to support their site. This is not always the case with some commercial products. As I will detail in the review, Commons is not as fully featured out of the box as some competing products, but it does act as a solid base to build upon. So it’s value is really going to be determined based on an organization’s comparison of how much it costs to build a Commons-based site with desired customizations vs. how much the cost would be to use a competing product that provides more functionality out of the box. 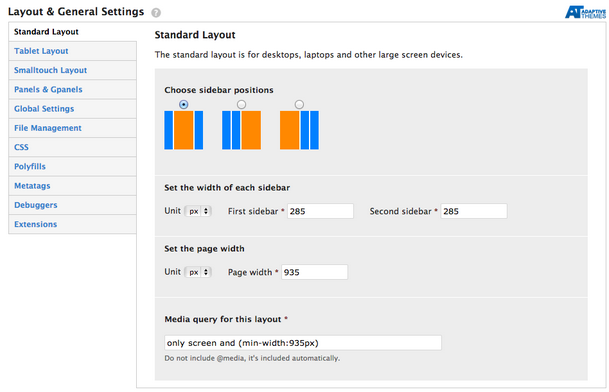 The ability to customize Commons or any Drupal site is really one of it’s biggest selling points. Drupal’s flexibility and power make it one of the premier platforms in the CMS space. So having both a solid platform like Commons, plus the ability to customize for the needs of an organization is a really big selling point. Commons like many other platforms, gives you several tools for customizing the platform from within the site itself. This aspect alone does not differentiate Commons from other platforms in and of itself. Many platforms will allow you make changes from within the site itself. Some products will be much more user-friendly than Commons/Drupal. The real strength with Drupal of course is the ability to download thousands of modules, i.e. plugins, as well as themes to extend it’s functionality. You are not limited to only these modules because you can create and deploy custom modules as well. As I alluded to in cost, the value of this platform is really tied directly to a company’s desire to customize the site to fit their specific organizational needs. At the moment, Mediacurrent is using Yammer for intra-office communication which provides very little customization. On the other hand we use Open Atrium for project management as we have a strong need for customization. This is a key factor when evaluating this product against all others. One of the key features of Commons is simply that it can be used as an intranet or a public social business platform, like https://dev.twitter.com/. Or both. With groups-based permissions you could have some private and public groups, depending on what your organization is trying to accomplish. This is certainly an advantage. As with any Drupal site you could run a multi-site off of the same platform, which means that you could have a network of sites similar to what Sharepoint offers. Another big selling point for Commons is that it is responsive out of the box. The downside is that there are no out of the box apps that I am aware of. 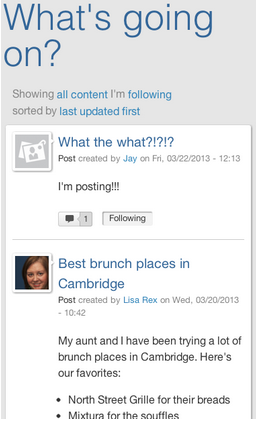 You will see a typical list of content features such as groups, events, wiki, polls, questions etc. that you see across most platforms. I will not go into detail other than to say that you can read about the latest features here. Otherwise the best way to get a feel for Commons is to try it out yourself. One way to try out Commons is to find a trial online if you do not how to install it locally yourself. 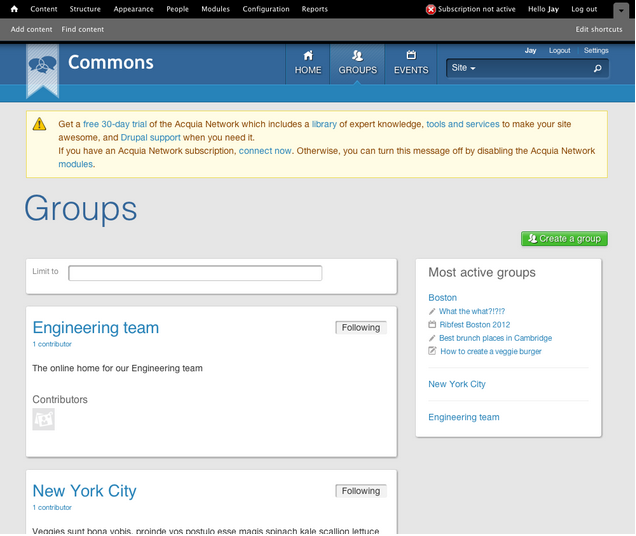 I believe that Acquia has a way to try out their web hosting services which would include the ability to install Commons. You can also use WebEnabled which is easy as well as getpantheon.com to install Commons for free. I personally feel that Commons is pretty intuitive, but I am also biased as a long time Drupal developer. As far as user-friendliness goes I do not think it can match the likes of Jive. I really think that for many organizations if you log into a Commons site and play around with it, you will either like the way it is organized or you won’t. Every competing product has ways to add groups, discussions, polls, blogs, etc. but they all organize the content differently. The first decision each organization has to make when evaluating these platforms - “Do I like the way this works?” For our customers, who generally like Drupal to begin with, I would have no hesitation recommending Commons. For companies that don’t already use Drupal, it’s really about their impression of how Drupal operates that will drive whether or not they seriously evaluate Commons as the best solution for their site. The biggest selling point that Acquia promotes is the ability for an organization to use one platform for all of their sites. They go in-depth in their Commons 3.0 webinar which can be found on Youtube. This means essentially that you can run Drupal for both your main website as well as your intranet. Being able to develop and customize one platform is going to be easier than potentially pairing multiple systems together. To be clear, I would agree that Commons is going to be more attractive if a company wants to use Drupal for all of their sites, as opposed to a company that would only be using Drupal for their intranet. So this factor should be considered. To summarize, I would evaluate Commons as being suited best for organizations that want to leverage one platform uniquely tailored for their organizational needs. Commons will have more up-front costs than some online platforms, which use monthly billing; so it is not always the best fit compared to a free or cheaper online-only product which has more functionality out of the box. My goal for this 3-part blog series was to give a fair comparison of three of the leading tools in the “Social Business Platform” space. At Mediacurrent we have built several intranet sites and are often asked to compare Drupal-based platforms with other products. I realize there are several platforms out there that I did not mention and several additional features that were left out in this roundup comparison. Feedback is welcome! If you feel like I left out some critical features or other leading products that we should evaluate against these platforms, let me know in the comments section. I am also available on Twitter at https://twitter.com/drupalninja. I recently used Drupal commons for building a social platform, and it reduced 70% of my time and no license cost involved. Nice! Yes I think it's a really solid product. Interesting. I wasn't aware of Commons, but as a company that uses Drupal for our magazine sites, this might be worth checking more into. Thanks! Commons and other Drupal distributions are a great way to jump-start development of a site. Distributions are great solutions when the out of the box features match up with most of your needs, but if the feature set of the distribution does not match 75-80% of your needs out of the box, then a custom configured Drupal solution may be better. Good article. There's another aspect which needs discussion: hosted vs on premise. Organizations that want to host their platform on premise will be interested in understanding the differences in administration time and effort as wells as differences in difficulty of patching and upgrading, maintenance, security issue communication... Organizations that want a hosted platform will be interested in understanding their options, what will be covered by their contracts, etc. Guys, can Drupal be used as a integrated management software? Please define "integrated management software." Please don't (never!) start with product to solve a problem. Sheesh. Try and describe the business problem, the advantage you hope to gain, then work backwards. It is call design thinking or design for innovation. Yes, for IT wonks and pot-bellied CIOs, it is apostasy. Sooner or later the product-centric vendor hubris must give away to creating genuine value.